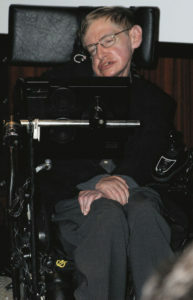 Stephen Hawking in 2006. Photo credit: Wikimedia Commons. I’m assuming all of my readers heard this news yesterday, but the famous physicist Stephen Hawking is dead. The world is a dimmer and sadder place without him. I doubt any of his friends and loved ones will read this, but I’d like to extend my sincere condolences to them if they do. A Brief History of Time was one of my all-time favourite pop-science reads. The only science classes I took in high school were Biology and Chemistry, so he was my first introduction to Cosmology and Physics. He explained everything so clearly and concisely in the things he wrote for a general audience. By far the best part of A Brief History of Time in particular was the section on black holes. Mr. Hawking’s theories about how they worked and why it’s actually possible for some material to escape a black hole blew my mind. It sounded like something from a science fiction novel, yet it was happening in our universe and it could be explained in purely scientific terms. There’s something special about touching the far reaches of current human knowledge like that. Not every physicist is capable of explaining his or her work so well to people who have little to no understanding of what physics is about or how physicists are slowing figuring out more and more details about how the universe works and how it began. In 2014, Stephen Hawking asked science fiction writers to incorporate his ideas about imaginary time into their stories. To the best of my knowledge, no one has taken him up on that challenge yet. (If any of my readers know of any plausible hard science fiction books, movies, or TV shows that are based on Stephen Hawking’s work, do mention them in the comment section below! Everything I could find online about this topic involved soft science fiction like Futurama or Doctor Who. Mr. Hawking, thank you for everything you did for the scientific community. Thank you for inspiring generations of science fiction authors, too. May you rest in peace. It surprises me how disinterested we are today about things like physics, space, the universe and philosophy of our existence, our purpose, our final destination. It’s a crazy world out there. Be curious.